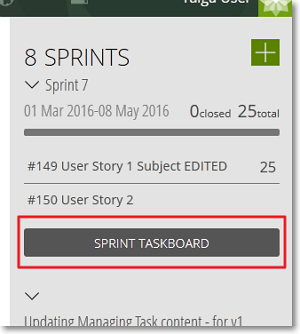 You can use the TASKBOARD to view a list with all the User Stories that belong to a Sprint and to view and manage the Tasks that belong to each User Story. In addition, you can view information about the Sprint (progress, total points, completed points etc.) as well as a burn-down chart for the Sprint. Note: The TASKBOARD is available only for SCRUM projects or projects that have the BACKLOG module enabled.